Well, maybe not exactly a true flash mob, but certainly the avian equivalent was in full swing as I left the house yesterday morning. Stepping into the garden before setting off on a birding walk around Deer Lake, I was immediately aware that something was up. In the trees behind the house, a very agitated flock of small birds was calling and scolding and acting very excitedly. Such a mob scene usually indicates a predator is present, and often it’s an owl. 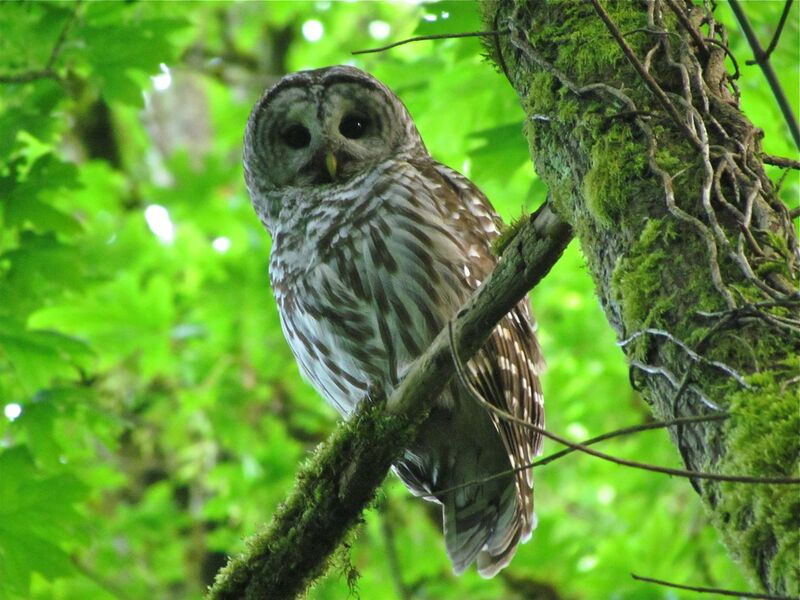 The centre of all the action was a western redcedar tree where I soon located the target of all the excitement and distress – a Barred Owl perched about 15m off the ground, staring down with its large, dark eyes as I made my way toward it. I could almost imagine its irritation at me now joining the mob. It was having enough trouble with the chickadees, nuthatches, kinglets, and robins that were kicking up a racket all around it. Mobbing, as this behaviour is called, is practised by many birds. In forested areas, it’s mostly small birds in mixed species flocks like yesterday, and sometimes in single species flocks that gather around a predator in an attempt to drive it off, identify its location for other birds, and perhaps teach younger birds to recognize predators. Chickadees are frequently the noisy instigators, and other birds join in. Some keep their distance, while others will actually fly at the bird to peck at it in an attempt to get it to move on – a risky strategy. Sometimes it works, and at other times the predator hangs in until the excitement subsides. Yesterday’s mob was successful. When I returned a couple of hours later, the owl had left. In open areas, and frequently in nesting season, crows, blackbirds and swallows are often the lead mobsters, and their targets are our resident Red-tailed and Cooper’s Hawks. Yesterday’s flash mob didn’t require texting, or social media to organize, just a group of noisy, frenzied birds to send the message out through the woods for others to join in, and get that owl out of there. As you’re walking our parks, listen out for these noisy gatherings. It’s not always an owl that’s the target, but sometimes cats, raccoons and squirrels will prompt the same behaviour. For a full list of birds I saw around the lake yesterday click here. The observant among you may notice that the owl picture above was not taken in a redcedar tree. I couldn’t get a good photograph yesterday; it was just too dark for my camera. I photographed the owl pictured above this spring, less than 50 m from the site of yesterday’s action. It could well have been the same bird. There is a pair in residence in the area. 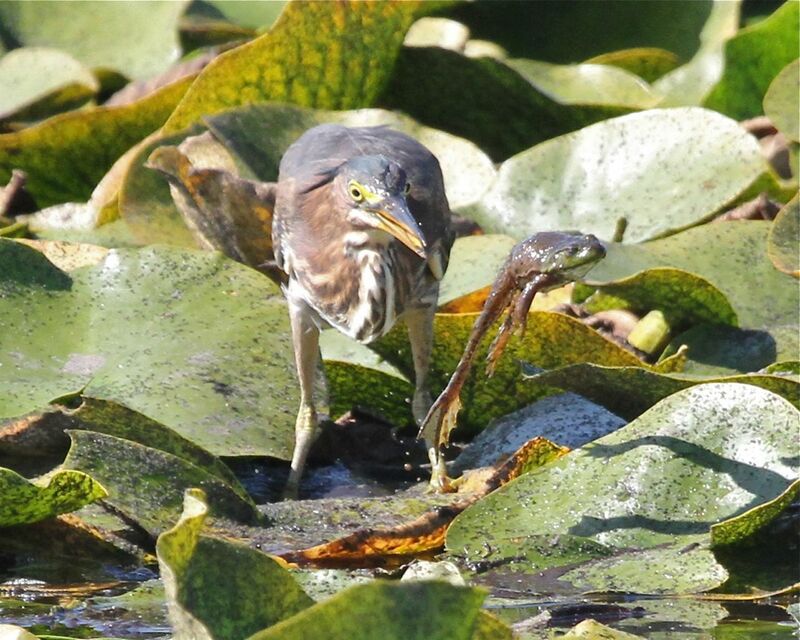 The two juvenile Green Herons that turned up at Piper Spit on Burnaby Lake yesterday morning are calling into question the truth of Kermit the Frog’s well known lament, It’s not easy being green. Watching these two young birds catch ‘minnows’ at the mouth of Eagle Creek, swallow one after another, and then follow-up their feasting with an extended period of preening in the surrounding trees, suggests the more appropriate song would be Summertime and the Livin’ is Easy – even if you are green. 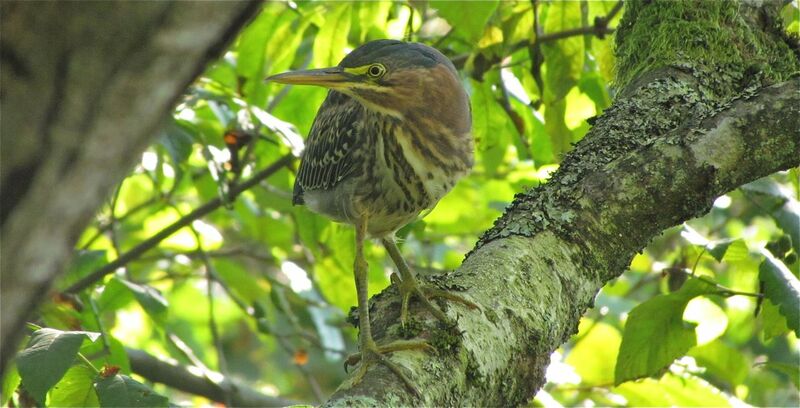 Green Herons, the second smallest of the herons in North America, are at the Northern limit of their range in Southern BC, but can be found throughout the Americas, as far south as Venezuela where suitable wet, marshy habitats provide them with what they need to find cover, eat and reproduce. They are very uncommon in these parts, and only rarely will one spend the winter here. 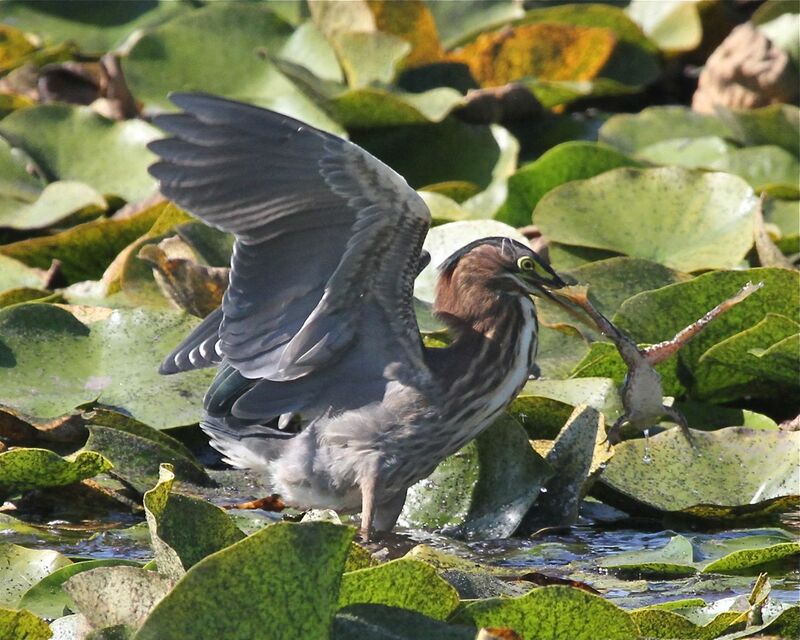 Compared to the much more common and more familiar Great Blue Heron, Green Herons weigh in at around 210 g (7 oz) with a wingspan of 66 cm (26 inches), while Great Blues weigh in at a comparatively whopping 2.4 kg (5.3 lbs) and a have a wingspan of 1.83 meters (72 inches). Green and small they may be, but they’re super efficient hunters. That sharp, pointed bill is used to deadly effect when hunting fish, their main prey, but it is no less effective when taking various insects and other invertebrates which also make up their diet. In common with all herons, their forward-angled eyes give them 3-D vision for pin-point accuracy. only to be recaptured… Yikes! and finally to meet its end. Oh dear! It seems Kermit was correct after all. The three action photographs above were taken by John and Sheila Linn who are ardent photographers of nature in Burnaby. They capture many wonderful images of the wildlife and drama in our city’s parks. Thank you, John and Sheila for this wonderful sequence. 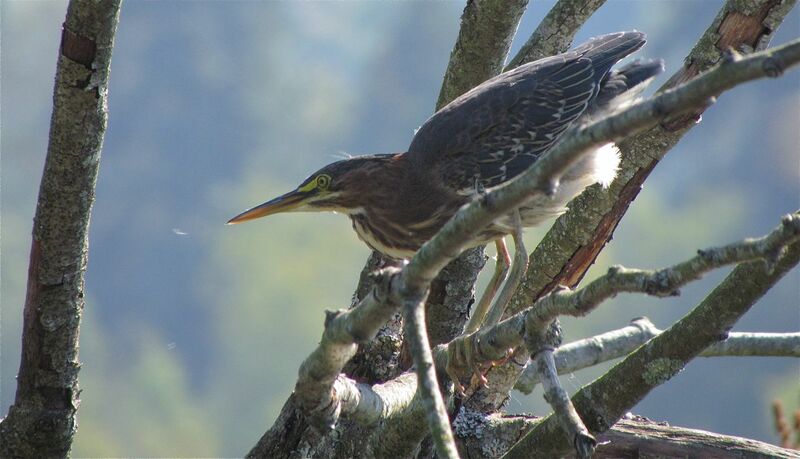 And a final note about the birds: both Green Herons still have some residual natal down on their heads which suggests they are local birds, born and bred on Burnaby Lake, or more likely along one of its tributary creeks. 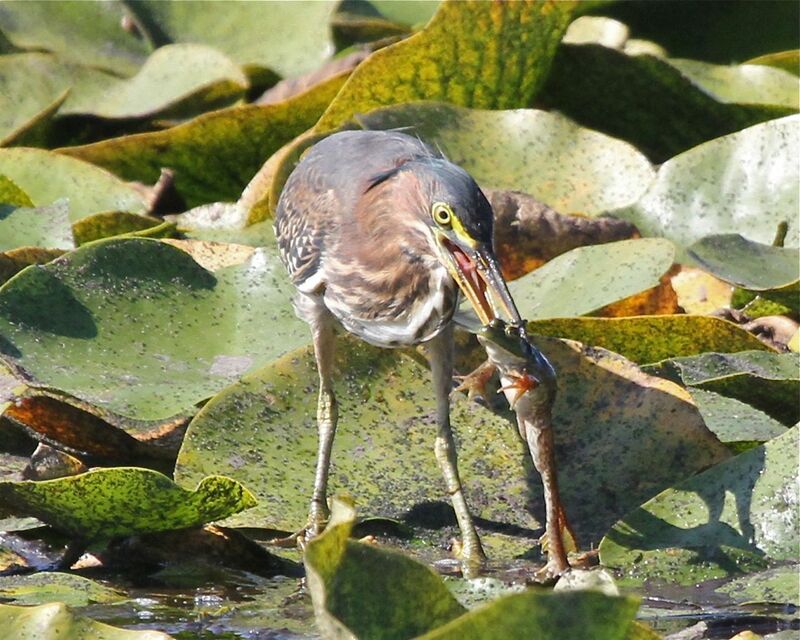 And a final note about Kermit’s brethren above: the frog that became lunch for one of the herons is a non-native species, a Green Frog. Along with Bullfrogs, which are also common in the Lake, they are wreaking havoc with our much smaller native frogs, by outcompeting them and frequently eating them. So let’s hear a cheer for the herons, doing their bit to control introduced species. You might call it Indian summer and love it, or you might lament that this marvellous stretch of weather we’re having comes when most of us are heading back to school and to work. Too bad we can revel in it only on weekends, whereas Monday to Friday doesn’t leave much time. And worse still, the special foggy piece that comes along with the weather is very easy to miss. 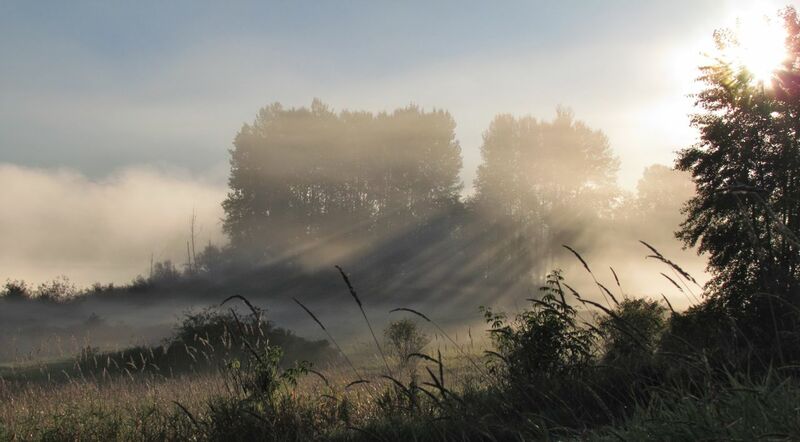 This fleeting phenomenon, like so many of the great things happening in our parks, is best seen in the early morning. Our weather forecasters certainly love this weather. It’s their time of the year to get the forecasts bang-on correct. They deserve it. Let’s face it, being a meteorologist here on the West Coast can’t be much fun for most of the year. No fronts sweeping in off the Pacific, just day after day of ‘sunny tomorrow, and the day after, and…’ . An end-of-summer high pressure system has settled over the Coast, and is bringing us cool nights, warm days, and day-long blue skies and sunshine. 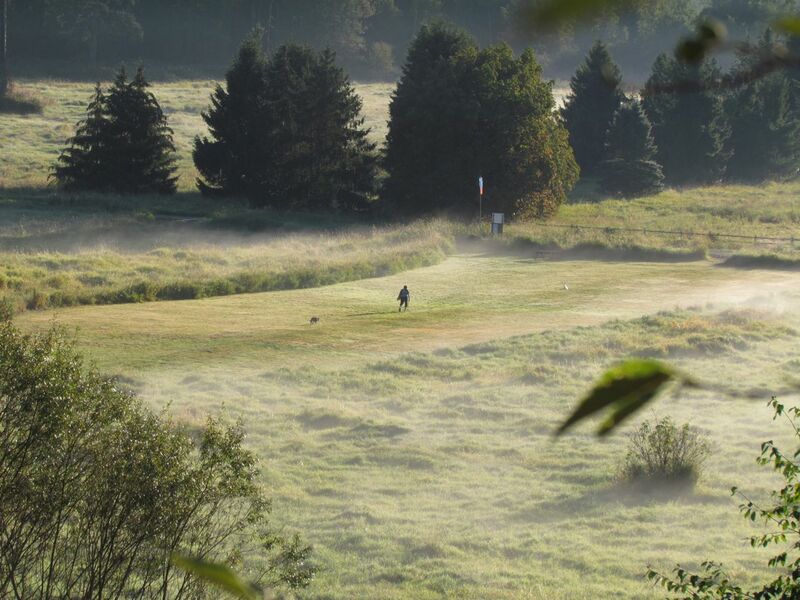 However, just as the sun breaks over the horizon in the morning, our parks are magically transformed by fog. 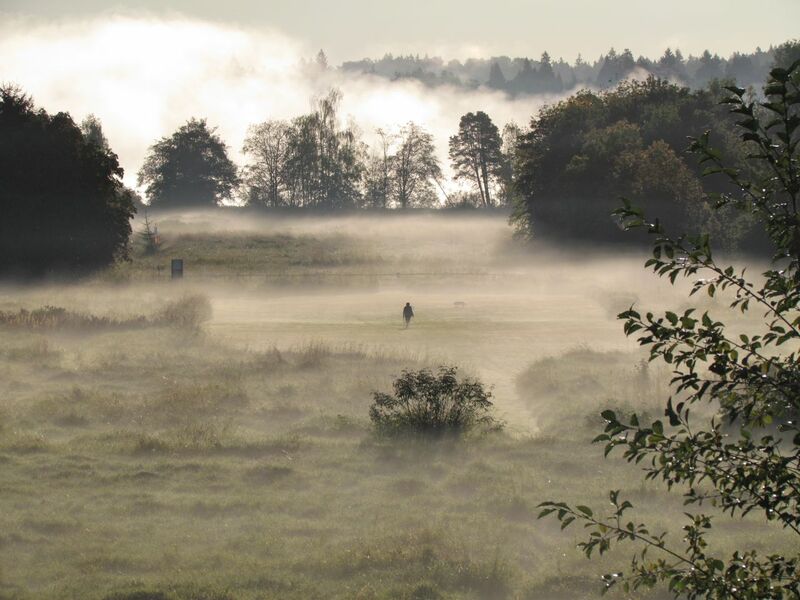 With clear skies overnight, the ground radiates its daytime heat right back into space – no clouds to provide a warming ‘blanket.’ The result: the air closest to the ground is cooler than the air immediately above it, and the moisture in that cooler air condenses forming minute droplets – fog, technically speaking, radiation fog. but only briefly. The sun rapidly burns off nature’s transformer, and we’re back to clear landscapes, and no hint of what was there minutes before. but when you look at a more oblique angle, the fog just about disappears. The two pictures above of the foggy doggy walker were taken less than 30 seconds apart. The fog really didn’t change in that time, but my angle in relation to the sun did. So check it out. Take a few minutes if you can on your way to work or school to take a look. Right now the best time is right around sunrise, and the event is pretty well over in an hour. If you’re late for work, say I said it’s OK. Sorry, but I can’t give permission to be late for school. You’re on your own for that one! 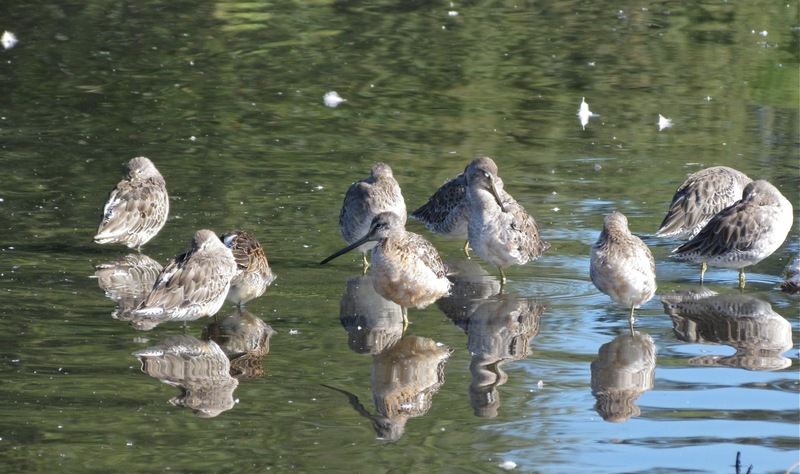 While Burnaby is a great place to see many different types of birds, our number and diversity of shorebirds, or waders as the English call them, is only modest. We just don’t have the river estuaries and mudflats that many species of these long-legged probers depend on for food. But we do have some places to observe them, and they are often up close and easy to observe. Remember to click on the images to enlarge. Burnaby Lake, and Piper Spit in particular, is probably our best and most reliable spot to see these birds. Where Eagle Creek enters the lake, a small mudflat often hosts a small flock of Long-billed Dowitchers. Here they are above, snoozing and preening. The spit boardwalk gives good close views. 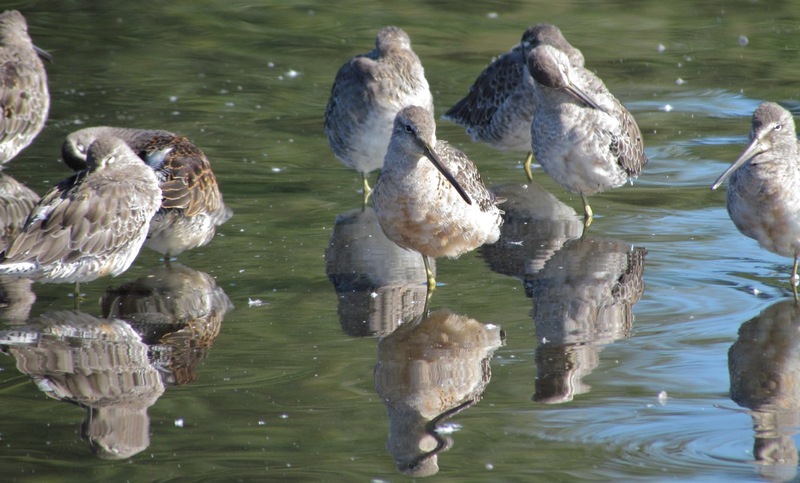 Appropriately named Long-billed Dowitchers? I think so. Look at those bills! But having said that, their close relatives, the Short-billed Dowitchers, confusingly have bills much the same length! In fact, you can’t tell the difference in the field by bill length. The easiest way to tell them apart is by voice. When they are vocal, you’ll hear the ones at Piper Spit make a loud, single Keek! Short-billed have a three-part Tu Tu Tu! call. There are plumage differences between the two species, but they are subtle and difficult to discern without binoculars. Even experienced birders find separating the two species a challenge at times. Fortunately for us, the two dowitchers separate themselves much of the time by habitat. Long-billed prefer freshwater wetlands, like Burnaby Lake, whereas Short-billed prefer saltwater or brackish wetlands and mudflats. Stretching its wing, the bird above is showing us what it uses to get to Burnaby from its breeding grounds in Western and Northern Alaska, and North East Siberia. It may seem a long way from the Arctic coastal plains to Burnaby, but many other shorebird species travel vast distances from the Arctic to as far south as southern South America. So by contrast, Long-billed Dowitchers are considered medium distance migrants. Seems a good stretch to me nonetheless. They will spend the winter with us in Burnaby, and except for places like Delta on the Fraser Estuary, and the head of Port Moody Arm, we have the largest wintering population of these birds in the Burnaby/Vancouver area. We have recorded close to 100 here on the annual Christmas Bird Count. 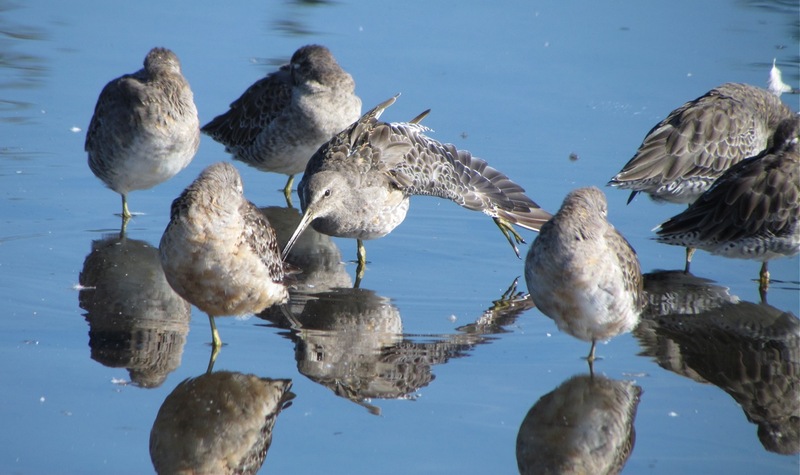 And as for that unusual, delightful name, dowitcher seems to derive from the Iroquoian word ‘tawistawis’ meaning ‘snipe’, and may have been appropriated by white European hunters in the 19th century on the Eastern Seaboard of North America. 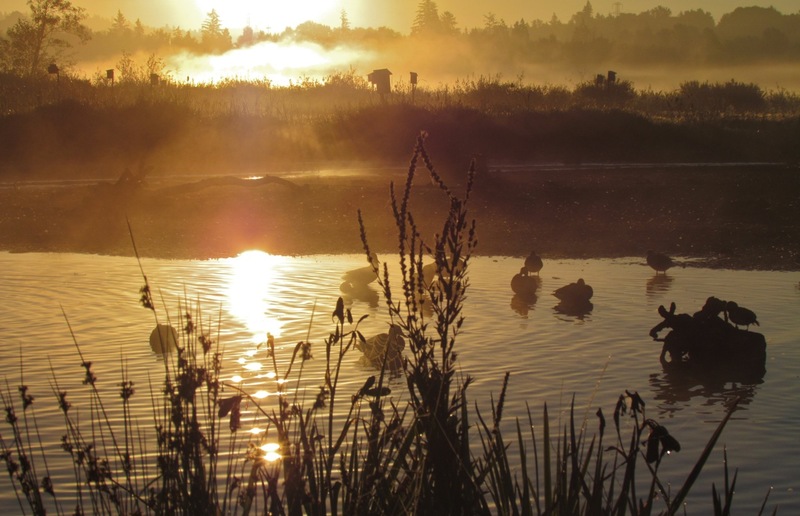 Enjoy our Burnaby Lake tawistawis; they should be with us from fall through to spring. As August rolls into September, there’s lots of birdy action in the park, and a real feeling things are about to change. It’s a Janus time of year – looking back at summer, looking forward to fall. Looking back: today I watched a Willow Flycatcher still feeding a newly-fledged youngster– a real summer sighting. 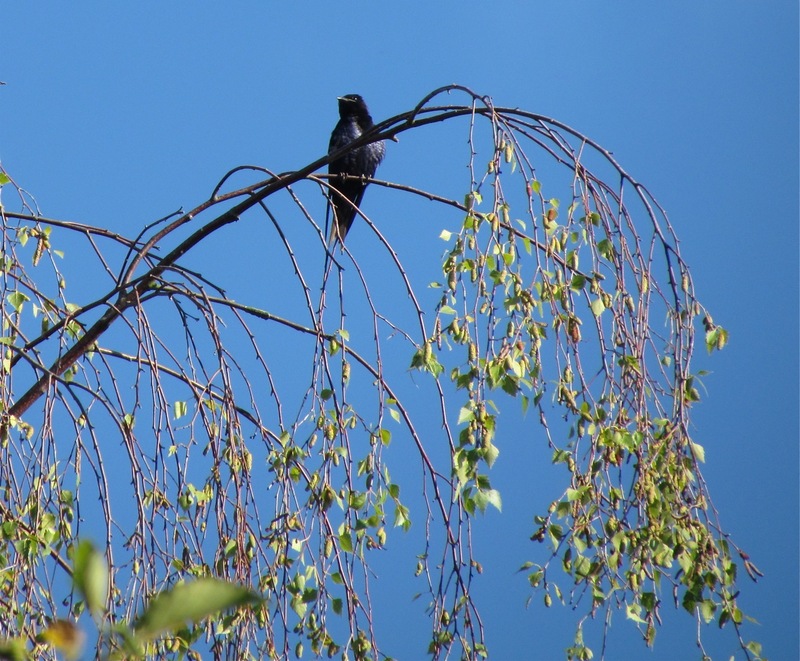 Looking forward, and a real pointer to fall, the Purple Martins are gathering in a noisy, energetic, and exuberant convocation in the tree tops along the boardwalk at the west end of Deer Lake signalling their intentions to soon head south. And pretty far south they go too. How about south-eastern Brazil? Incredible! Here’s a group of three juveniles (upper), and what is likely an adult female (lowest bird), which were part of a gathering of more than thirty Purple Martins seen today (August 30th). Purple Martins are North America’s largest member of the swallow family, and one of the largest swallows in the world. Compared to the more familiar Barn Swallow, you know, the ones that nest in the barns where many of us buy our veggies from the farms down on Marine Drive, they weigh-in at almost three times the size (56 g vs 19g). With a wingspan of almost 47 cm, that’s almost half a meter, this is a heck of a swallow. And just like their smaller cousins, who classically line up along telephone wires and power lines prior to migration, Purple Martins gather in large groups too, made up of both adults and young, before they migrate. 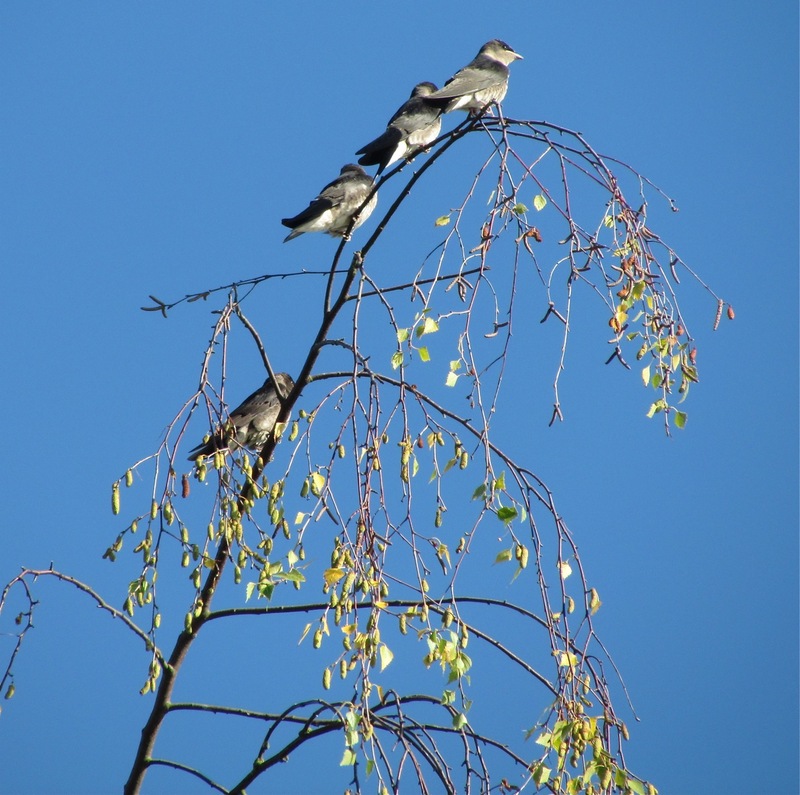 Here out west, they often gather in tree tops, particularly if dead or bare branches are available for easy perching. Our western Purple Martins are a marvellous conservation success story. They are the comeback kids of coastal BC. By the early 1980’s the estimated BC population was in the order of ten breeding pairs only. That minuscule number was a clear signal we were about to lose them from the Province. In technical lingo, they were facing extirpation. We’d logged the old growth forests, removed snags, cleared burned areas, removed the old pilings from harbours and docks, and introduced House Sparrows and European Starlings. All of these factors led to the disappearance, or the occupation, in the case of the sparrows and starlings, of the woodpecker holes and crevices in pilings that the martins needed to nest. Purple Martins are cavity nesters, and the solution to their decline was to provide them with artificial nest boxes over water. In 1986 a program of installing nest boxes on pilings in coastal areas was started by dedicated groups of volunteers, both here on the Mainland and on Vancouver Island. The first successes were on the east coast of the Island on the Cowichan Estuary. In 1994, Maplewood Flats, just across Burrard Inlet from here, was the first successful re-nesting location on the Mainland. They hadn’t bred on the Mainland for probably more than thirty years. Kudos to the volunteers, and what a wonderful pay-off for everyone. We’re now enjoying the fruits of these efforts in Burnaby. Our western martins are a little different from their eastern counterparts. They don’t use the classic condominium-style martin nest boxes that you would see in Ontario, Quebec, and the eastern U.S. Our birds nest in colonies too, but they are more loosely structured. They prefer individual nest boxes. Maplewood Flats in North Vancouver, and Rocky Point Park in Port Coquitlam are good places to see the nest boxes on pilings. We may have a few nesting here on the pilings at Barnet Marine Park. We’ll have to check it out next spring to see. I didn’t get down there this year to see what’s happening. Since the conservation effort started 26 years ago the BC Purple Martin population has increased dramatically reaching 735 pairs in 2011. Isn’t it fantastic what a little TLC can achieve? In previous years, we’ve had over 100 birds in the park at this time of year. They should be here until mid-September, but their departure date and time varies from year to year. They’re Canadian birds, after all, and a bit unpredictable; kind of like our national airline. So take a Deer Lake walk. You’ll hear the martins before you see them. Their beautiful, melodious warbles will cascade down from the air above. Along the boardwalk you’ll have a good chance to see them perched in the taller trees. They also like the big, old snag in the middle of the tall grass meadow near the bio-filtration pond. Here’s a link to listen to Purple Martin vocalizations. Click here. A full list of birds from my August 30th walk is here. Postscript: the gathering of the martins was brief this year. They were all gone, left for points south, by September 5th. Weather conditions were just right I presume, and Brazil via Mexico was beckoning. The urge to migrate is is irresistable.